It is made of the best calcium carbonate and has earned Korea Product Safety (KC) Certification. In terms of package, 1 pack consists of 72 chalks, and 1 box contains 18 packs. 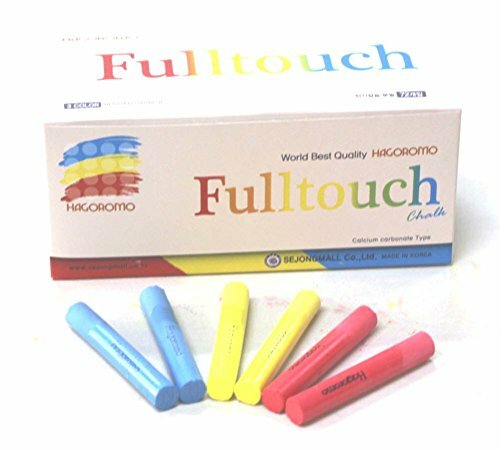 White chalk and 9 colored ones (red, yellow, blue, yellow green, Scarlet, orange, violet, green and brown) are available. In addition, a 5-color mix (red, yellow, blue, yellow green and orange) and a 3-color mix (red, yellow and blue) are offered. In terms of small package, a white pack (5 chalks), a 3-color mix (white, yellow and red) (5 chalks) and a 10-color mix (white and all colored chalks) (12 chalks) are available. If you have any questions about this product by Hagoromo, contact us by completing and submitting the form below. If you are looking for a specif part number, please include it with your message.